I’d be an awful Gunma-ite if I didn’t start posting any postcards from my adopted prefecture! 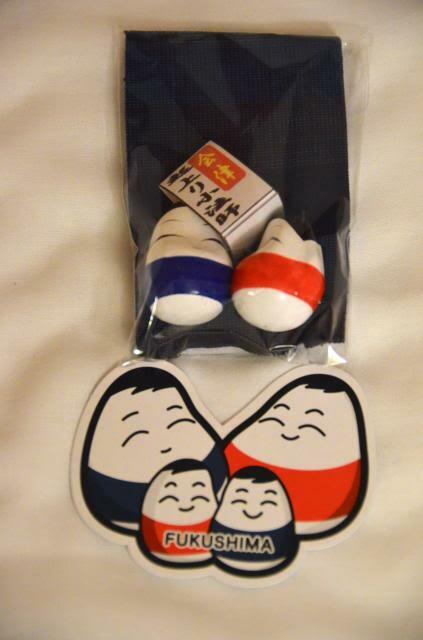 And where better to start than with the postcard that started it all and my very first one, Gunma’s Daruma Doll. This is the postcard that first caught my notice in my local post office. I bought one or two as gifts, and didn’t think anything of them, until I saw another one in another prefecture’s office while traveling, and grew curious. So you can thank this guy for this site! Daruma dolls are “okiagari” dolls, which means they have rounded bottoms which allow them to stand back up if pushed down. I’ve already written about Fukushima’s Okiagari Koboshi dolls here, and will get to Ishikawa’s Okiagari dolls eventually. Gunma style dolls are modeled after the Buddhist Bodhidharma, and are sometimes also called “Dharma” dolls. They are traditionally red in color, though these days come in many colors and styles, and are considered a symbol of good luck. 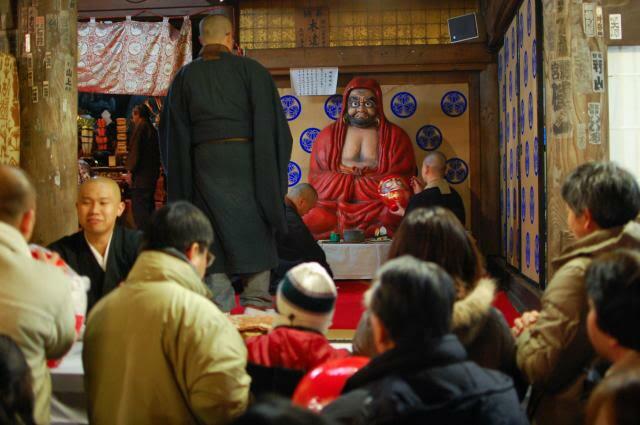 The Gunma-style dolls are said to originate at the “Daruma-dera” Temple in Takasaki. Priests were overwhelmed with the parishioners need for charms, since all charms in Japan have a one-year expiration date, so they set the parishioners themselves to making the dolls to save them the work. A few major families around Takasaki still make these today, and sell them at Takasaki’s “Daruma-dera”, actually Shorinzan, on the “Daruma-Ichi” Market on January 6th every year. 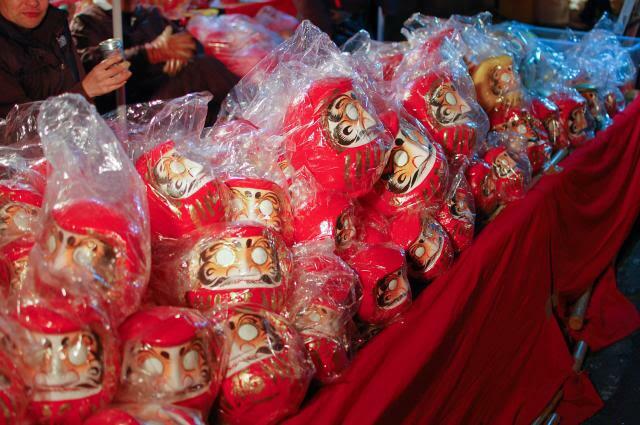 Daruma are usually painted with the symbol for “luck” on them, and are bought with both eyes blank white. The buyer then paints in the right eye while making a goal or wish for the year. When the goal or wish comes true, the other eye is painted in. This makes them very popular with businesses, which wish for a successful year. Therefore large Daruma are often seen in offices around Kanto and Gunma especially. 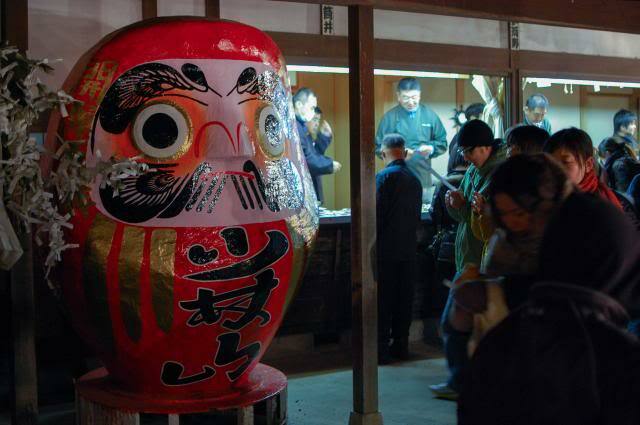 The main temple associated with Daruma is Shorinzan in Takasaki, which holds the annual Daruma-Ichi Market on January 6th every year. I visited this temple for the market before I even knew of these postcards, so I didn’t have one to take pictures with at that time. I hope to update later with some new pictures featuring the postcard, but meanwhile, enjoy a few pictures of the Market! There is a large Daruma statue on the temple grounds, but they are featured everywhere… along the roads, on the bridges, all over the station… Takasaki holds a lot of pride for their famous goods! 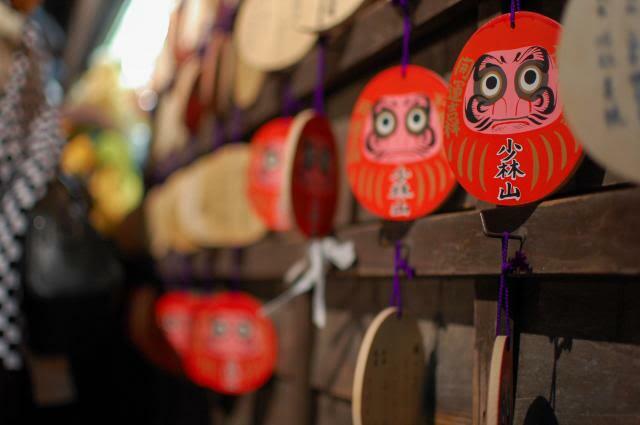 Even the “ema” for the temple are Daruma-shaped! The original Daruma himself! Can you see the resemblance? 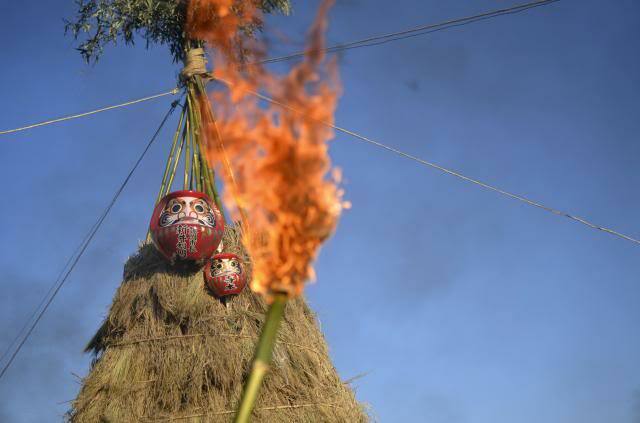 Before buying new daruma, you give the old one back to the temple to be burned later. 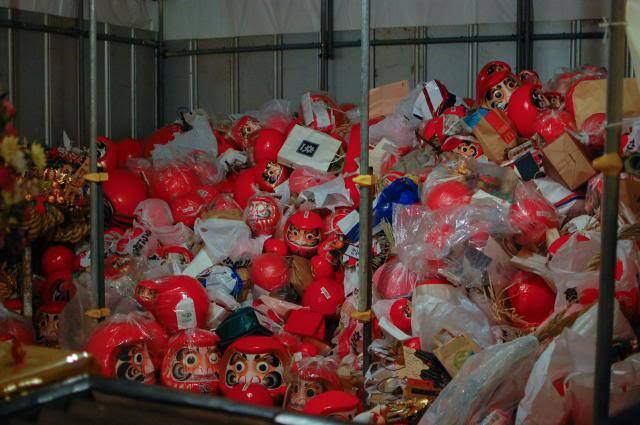 Giant piles of daruma result when everyone brings theirs back! 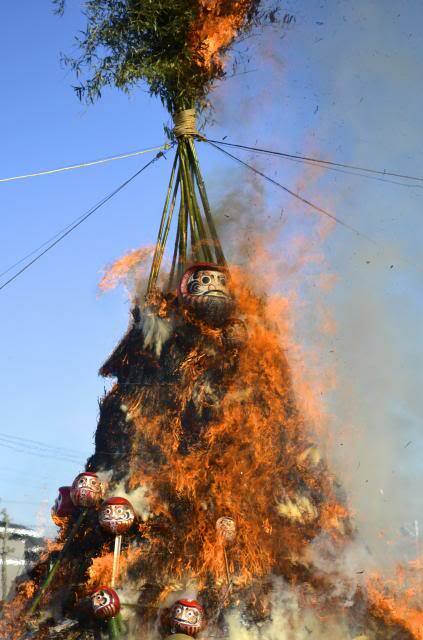 I’ve never attended a burning at Shorinzan, but I have gone to a local one, which we call “Dondoyaki”. 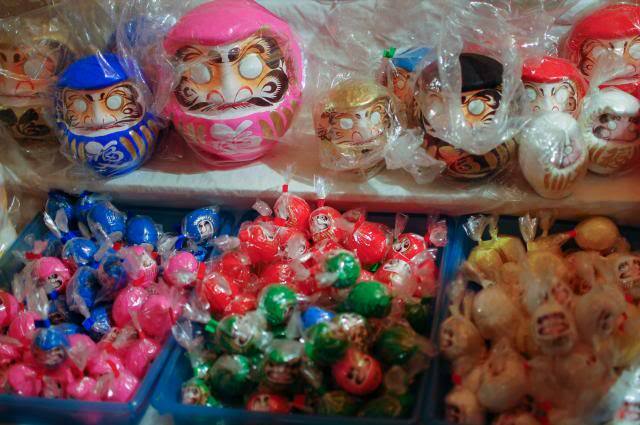 Finally, even for those unable to attend the Daruma-Ichi Market at Shorinzan, you can still enjoy Daruma around Takasaki! 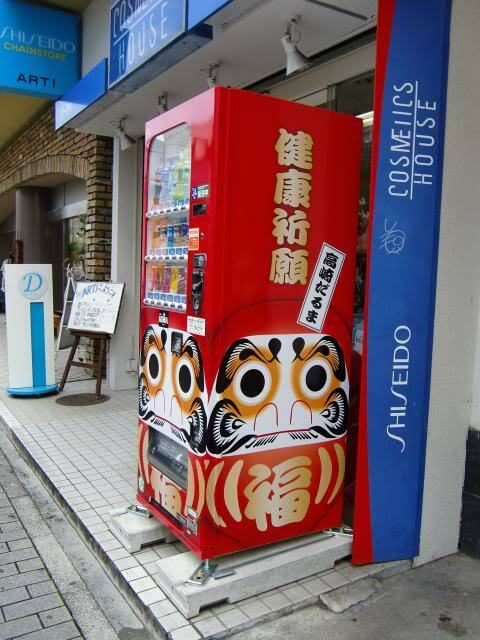 Even the drink machines are Daruma-themed! 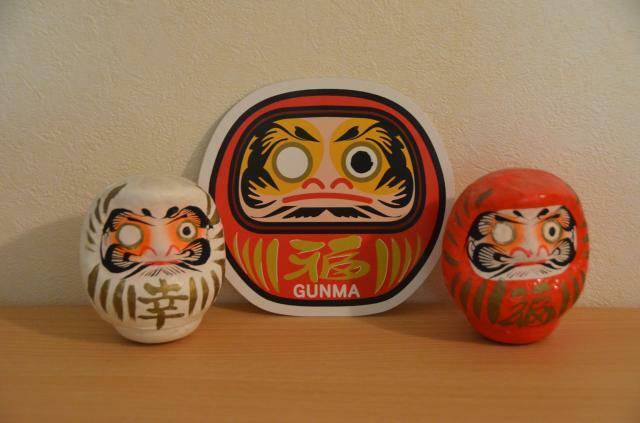 In Takasaki station, there is a store that sells a large amount of Daruma of all different sizes and colors, including themed Daruma, such as painted for the Zodiac year, or featuring Gunma’s cute character Gunma-chan. I like collecting the different styles almost as much as I like the original. Okiagari Koboshi are dolls with rounded bottoms, so that when you push them over, they don’t fall but roll back up into standing position. Dolls such as these are made all over Japan, with different styles and looks depending on where they come from. In fact, two other prefectures also feature dolls that wont knock down, Gunma’s Daruma dolls and Ishikawa’s cute Okiagari dolls. 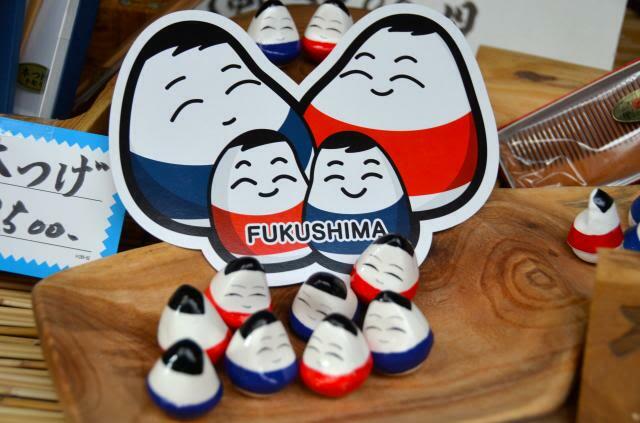 I’ll be writing about Gunma Daruma soon, but today let’s focus on Fukushima. Okiagari dolls across the board are considered good luck charms of perseverance and resilience, and are usually made of paper mache. 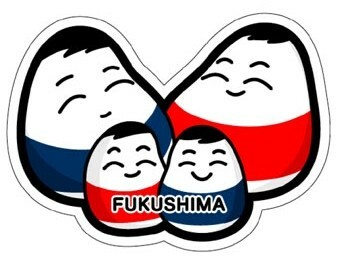 Fukushima dolls are painted most commonly in red and blue, with white and simplistic faces. Mini Okiagari Koboshi with a matching mini postcard! The most famous time to buy these dolls is during the Tokaichi (10th Day) Market in January in Aizu-Wakamatsu. You should throw a handful on the ground to check how well they stand back up, and buy the ones that do since those are considered lucky! Be sure to purchase one for each member of the family, plus one for future growth!